willinterview me for an article for an art magazine. Here are some of those for you to download for free. These articles may not be reproduced or sold. There is no more fascinating a subject to painters than color. in the composition — and the success — of a painting. THE PALETTE MAGAZINE special ordering site! 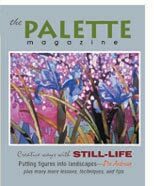 T he magazine designed to help you become a better painter! unique thoughts, feelings, and ideas. in this magazine will help you. How is this magazine different? online or through Cheap Joe's Art Stuff (1-800-227-2788). designed to help you find your own unique direction as a painter. you can try yourself. It's like getting a workshop in the mail! WATERMEDIA FOCUS COLLECTION special ordering site! is a MUST for every painter who wants to make their art more personal and expressive.With Watermedia Focus Workbook, you'll get the inside story on how prize-winning artists plan and execute their paintings. You'll also learn ways to make your use of color and design more exciting. 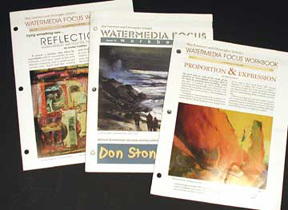 Now Watermedia Focus Workbook is available in book format for issues 1 through 15 for only $34.95. A beautiful hardbound book, it's nearly 200 pages of instruction. Many of these individual back issues are no longer available in single issue format...so this is your only chance to get some of these great articles and exercises. Fire up your paintings! Break out of that box! Express yourself even better through your paintings! call 800-227-2788, or go online to our special ordering site! Invite Topher and his best buddy Skip to your home! Now 4 great videos bring Skip Lawrence and Christopher Schink to your studio or art club. Watch in awe as Skip and Toph unravel the mysteries of the painting universe, such as composition, color, value, shape... and much more! Enjoy the demonstrations, then try them yourself. To order these videos visit the Cheap Joe's art site or click here.